Freya with a lovely young lady, ready to go for the ride of her life. We always have lots of exciting new projects in the works, not the least of which is a BRAND NEW rockinghorse! Vlad and Freya are going to be joined by an even larger new rockinghorse. Trey is going to be a Frisian, and will stand a solid six inches taller than Vlad! He's still in the preliminary stages of creation, but once he really gets going, he'll have his own feature page where you can watch him come to life. We are also ridiculously excited about an upcoming collaboration with Peter Beagle, the author of The Last Unicorn. Keep your eyes peeled for details soon! We'll be heading for the desert, for the High Desert Pirate Festival on March 18th and 19th. This will be in their new location in Hesperia, with a beautiful park with green grass, shade trees, and a meandering stream. Should be LOTS of fun, messing about with the Pirates, Mermaids, and other such Riff-Raff. Next up, the Tulare County Renaissance Festival, April 22nd and 23rd, easily accessible right near Highway 99 in Visalia. Another beautiful park with lots of shade, green grass, and fun for all ages. May 6th and 7th, up to Elverta, CA, near Sacramento, for the Golden Coast Adventure Faire, with a wide variety of areas, from Pirate, to Fantasy, to Steampunk, and more! May 20th and 21st, close to home, at the Fresno Pirate Festival, in Kearney Park. Another beautiful, green, shady park. You don't want to miss this one! In June, The Rocking Horse Guy leaves California again, this time heading north to Oregon, for the Oregon Renaissance Faire. Two weekends, June 10th and 11th, and 17th and 18th. We're very much looking forward to our first appearance at this event! Yes, you DID see us on MTV's the Real World! We were delighted to be on Real World La Jolla and rock one contestant's world. Freya has been featured in a video done by the lovely Brittany Hughes. 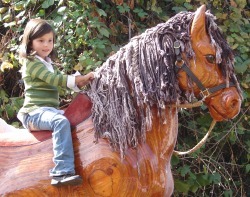 Read her blog about it here: Brittany Hughes on giant rocking horses.